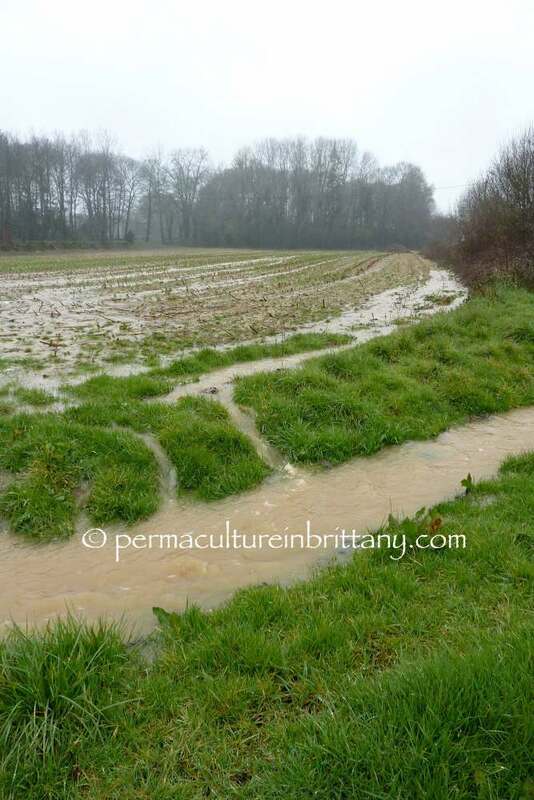 permaculture in brittany: Lucky us ! We’ve had a throw of the dice! In a winter noted for its wetness (see my previous damp posting) we discovered that we needed to re-roof our holiday rental cottage. 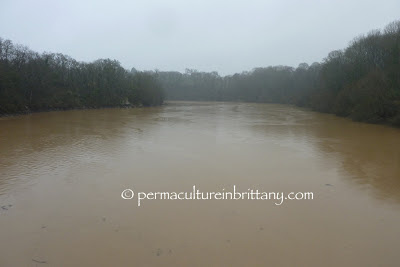 Ideally, we needed to do this during the quiet season, i.e., the winter, which has been notably wet. 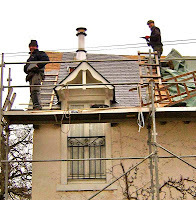 Roofing is a task that strongly benefits from dry days. 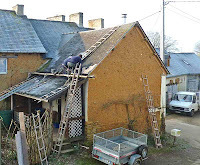 We started a fortnight ago today, stripping the front of the roof in a day, then wrapping it up with tarpaulins, “au cas où” (just in case). Work progressed well with any rain barely a splash and always overnight. I was busy on two fronts, with Andrew back for another volunteering session in our barn renovation. When Jacques the roofer didn’t need me, I joined Andrew in the barn. Jacques has an annoying habit of wanting to work until 7pm and, as part of the deal to keep the costs down was that I helped, my days were very long. Working with the willing Andrew on Saturday, the weekend seemed too short before Jacques returned on Monday (as Andrew headed home) and we attacked the simpler rear roof. We had three dry days and were sweeping up and loading Jacques lorry on Wednesday evening when a few spots of rain fell. It could do with a wash, he said, smiling. Well, it’s had one today, with 47mm of rain falling before it turned to snow. We can be quick to moan when things don’t always go as wanted, so it’s right to appreciate when one benefits from a stroke of luck. 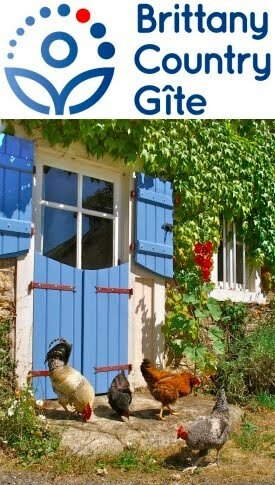 The holidaymakers that arrived yesterday confirmed that the inside of the gite is not only cosy but absolutely dry. I took these last two photos locally, which show how valuable, fertile topsoil is eroded from ploughed fields with little ground cover.